Enzo Wedding’s offers architecturally designed and truly unique wedding venue spaces in the Hunter Valley NSW. The wedding ceremony chapel features breathtaking floor to ceiling windows that bring the scenery indoors. The reception building features high pitched ceilings, a stunning sandstone fireplace, decadent chandeliers and glass doors that open out onto beautiful paved terrace. The spaces are intertwined with the tranquil vineyard setting onsite at Ironbark Hill Estate. Enzo Wedding’s offer a dedicated team and sole use of the facilities for your big day. A wedding ceremony at Enzo is unforgettable. 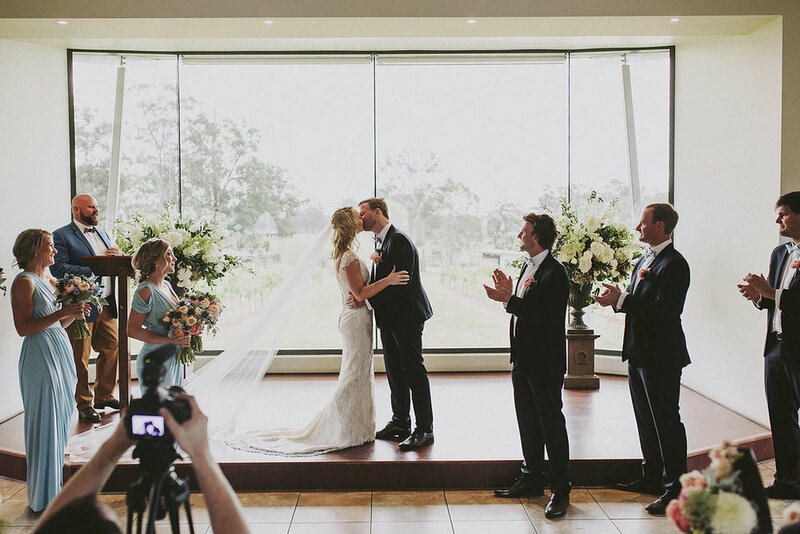 Stunning sunshine or the pita patter of rain, Enzo Hunter Valley has all the options covered with ceremony spaces including our stunning architecturally designed chapel or amongst the vineyards. The magic happens when entering the chapel, your guests are wowed by the stunning back drop floor to ceiling glass windows that look straight out onto the vineyards. This is the ultimate wow moment (expect tears from mum). With 30 acres of property, we have many different locations for an outdoor ceremony, from Ironbark trees to vineyards it is the perfect backdrop to your perfect wedding. Featuring a sandstone interior with an array of glass doors, our spectacular reception space caters for 80 to 150 adults for a sit down meal with space to dance the night away. You will instantly fall in love with the building, the high ceilings, the sand stone pillars which are complimented by a roaring sand stone fire place. The glass doors that line the building open onto the veranda that spills into the emerging vineyards. And our newest addition, three stunning chandeliers. Enzo Weddings is nestled onsite at Ironbark Hill Vineyard. When booking your wedding with Enzo, you would have access to the thirty acre stunning vineyards for your bridal photographs. The grounds feature vineyards, ironbark trees and buildings offering elements of stone and modern openness.